The WIchard Proline look good. MIghty costly on US and Australian sites - but how much does a life cost? I cannot seem to find a UK supplier. Any suggestion as the to the cheapest supplier? The best value is the Kong tether. Just as safe. About $100 for a 2-leg tether. The clips cost almost that much. No, that is a via ferrata tether. Different. The pouch contains an energy absorption device. Also, most sailors want a clip at the chest end (although debate will rage about quick release vs. not). Two Gibb hooks. The one on the yellow tether is from the 1970s, in fact it is from my original Hayward* harness, and the one on the blue tether is 1990s. * The safety harness, tether and jack lines were invented by Peter Hayward, the father of today’s yacht delivery business, after he lost a crew member overboard. Then Musto had the idea of including the harness in the oilskin jacket, and soneone replaced the original wire jack stays with webbing so it didn’t roll under foot, and here we are. I confess to still liking wire jack stays, rigged along the centre line, where you are less likely to tread on them. I regret that Peter Hayward’s name has been forgotten, considering how many lives he saved. Last edited by Minn; 09-02-19 at 18:06. ...Two Gibb hooks. The one on the yellow tether is from the 1970s, in fact it is from my original Hayward* harness, and the one on the blue tether is 1990s. There's another point here - about trusting 1970's webbing and stitching. I wouldn't. Exactly! The original design was strong and clever. The new design is, well, cheaper to make. I think it is that simple. BTW, the old style Wichard hook, though beastly difficult to open with cold hands, has stouter dimensions and does not share the same strength failings as the Spinlock hook. It is strong. That said, the sharp edges still cause it to fail any climbing standard, because they can cut ropes under high load; there is a radius requirement. I presume that is part of what prompted Wichard to develop the Porline hook, which is very nice (I use Proline, Kong Tang, and ICS Wals hooks--they are all very strong and very good with gloves. Yes, they are larger, which means they will not fit smaller pad eyes, BUT they are large enough to clip bow rails, which is a great use for your second leg. Regarding jackstays (jacklines is the US), one may boats they can run along cabin side, along chines, and in other places where they are not walked on. I encourage people to experiment with many temporary arrangements, until they find that which is neither underfoot, too near the edge (or bow or stern), nor in the way. Practice in light weather until you have something that does not tangle you up. Neither do I! 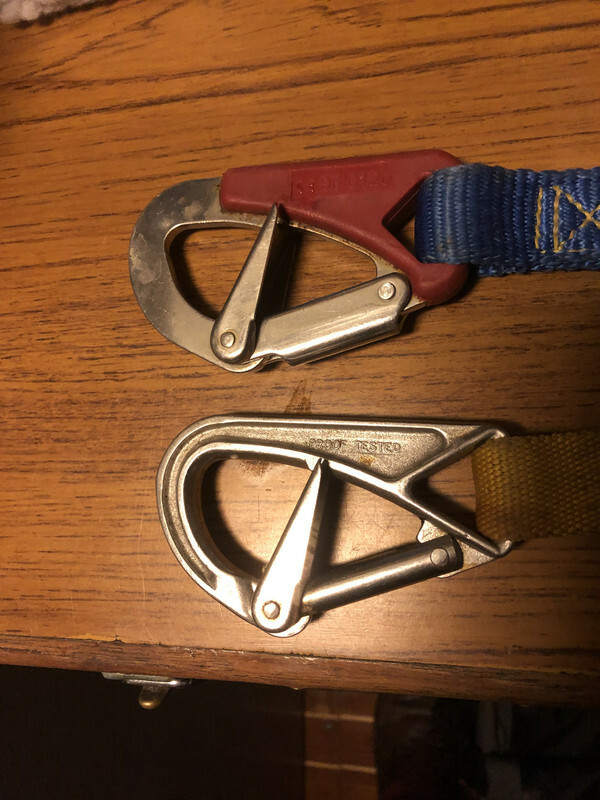 I retired those harnesses long ago, but I think the hooks are still good. Part of my point is/was - the Clipper incident might have been well publicised but the investigation, not (well publicised). As far as I am aware Thinwater is the only person to have investigated and it did not make it into the 'anglo saxon' yachting press. The MAIB is well aware of Thinwater's investigation as is the Clipper organisation - but neither have made mention, yet - and its months since the incident. I don't know if Clipper changed their hook part way through the last event - once they had Thinwater's results. My guess is those in the UK might be already preparing for offshore work this summer - it seems an opportune time to raise the issue. It also shows the value of rigorous investigative work by people who know something about the topic. Too often we have the armchair guru repeating an unsubstantied mantra. The very sad part is that a man's life was lost on a Clipper yacht - and perfectly adequate equipment was freely available and known to be more than adequate.. It merits repetition - but why the manufacturers did not pick this up is a real worry. Why the topic has slipped through the PBO net is another mystery. Last edited by Minn; 09-02-19 at 23:04.